The result of converting 4 separate Georgian townhouses is the Comfort Inn St Pancras Kings Cross. As you enter the hotel you find a lobby with recessed ceiling and furnished with black-leather couches. Art prints decorate the walls. Room amenities include en-suite (shower, complimentary toiletries), air conditioning, direct dial telephone, microwave oven (not all rooms), coffee/tea making facilities, desk, in-room safe, remote control TV with satellite channels and hair dryer. WiFi internet connection is available from all bedrooms and all parts of the hotel (charge). Room configurations cover singles, doubles, twins, triples, family rooms and one bedroom suites/apartments. The One bedroom apartment and suites have 2 rooms and have a double bed, sofa bed, dinning table & chairs, microwave oven, and a small fridge. All rooms no smoking. Bedrooms have electronic locks. The Comfort Inn St Pancras Kings Cross hotel serves continental breakfast (cereal, fruit juices, hot and cold drinks, yoghurts, toast, cheese, eggs, meats, rolls and pastries) onsite in dining room. Open: 07.00 till 09.30 (07.30 till 10.00 Sunday and bank holidays). 24 hour Front desk. Fax and photocopy service available. Iron and ironing board can be requested at the reception. Wireless internet access in all areas (charges apply). Incorporated within the hotel lobby is a small air-conditioned lounge area for guests to relax. Also in this area is a vending areas where machines dispense drinks and snacks. Hotel has a lift. All areas no-smoking. Nearest: Tube Station: King"s Cross Thameslink 140 yards (128 metres), Railway Station: London Kings Cross 0.09 miles (0.1 km), DLR Station: Tower Gateway 2.5 miles (4 km), Motorway: M1 Junction 1 5.5 miles (8.8 km). Within a half mile circle of the hotel (0.8 km) are no less than 4 mainline (overground) and 8 tube (underground) stations. The Comfort Inn St Pancras Kings Cross is situated close to three mainline stations, Kings Cross, St Pancras and Euston and convenient for anyone needing to get to both the City of London as well as the West End and central London. Also close by is the newly built British library which is well worth a visit. Other nearby attractions include Covent garden (1.3 miles), Theatre Museum (1.2 miles), Camden Market (1.3 miles), Trocadero centre (1.4 miles) and St Paul's Cathedral (1.5 miles). History: The hotel was originally called Comfort Innn Kings Cross with St Pancras being added to the name around 2014. Comfort Inn Kings Cross/St Pancras: is 195 yards (178 metres) away, has a guest satisfaction score of 78% and rates start from about £169. Comfort Inn Edgware Road: is 2.3 miles (3.7 km) from here, earns a customer rating of 71% and base rates begin at about £59. Comfort Inn Victoria Hotel: 2.8 miles (4.5 km), rated at 66% and with rates from around £113. Comfort Inn Westminster: 2.8 miles (4.5 km), rated at 65% and with rates from around £118. Compared to other London hotels: This hotel has been rated 65% by past guests. The London average is 80% and the average for 3 star hotels is 76%. Therefore this hotel is below average for its sector (star rating) . Comfort Inn Hotels across the chain average 66% so this hotel is slightly below the guest rating for most Comfort Inn hotels. Milesfaster ranking: 791st from 866 London hotels, 6th of 9 Comfort Inn Hotels, and 289th of 329 three star rated hotels. Another to Consider: Another hotel that is much like the Comfort Inn Kings Cross and not too far (0.3 miles, 0.6 km) would be the 3 star Travelodge Aldgate East, where prices begin from around £59 and which has a 60% guest satisfaction rating. Looking for lower base rates? Then another option might be the Pembridge Palace Hotel. 4.9 miles from here (7.9 km), has scored 61% from former guests and whose lowest rates start at about £40. 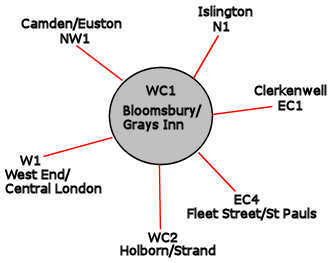 The fifty closest hotels from here (2-5 St Chad's St, WC1 postcode) that we have data for cover a 0.7 miles (1.2 km) radius. The 50 consist of 3 five star hotels (average rating 89%), 17 four star hotels (average rating 82%), 20 three star hotels (average rating 76%), 8 two star hotels (average rating 71%) and 2 one star hotels (average rating 62%). Top 3 star hotels are Premier Inn St Pancras, Premier Inn Holborn and Arosfa Hotel Bloomsbury (all three rated 90%). Of these hotels the highest rated is Montague On The Gardens Hotel (4 star) at 99%. Base Rates: See how the area stacks up for low rates using base rates. We use published base rates but note these do not reflect special offers or short term discounts so remain a rough guide. We have calculated the average base rate for all the 50 nearby hotels at £96 per night. The low end of the scale shows rates from £16 at Generator Hotel (2 Star, 77%) to a high of £222 at Renaissance St Pancras (5 Star, 89%). Rate averages for each star rating: Five Star average: £193, Four Star average: £119, Three Star average: £81, Two Star average: £56 and One Star average: £53. We rank hotels based on their guest rating but balanced for their influencing factors and we rank Comfort Inn St Pancras - Kings Cross 45th of 50 nearby hotels and 17th for the 20 three star hotels in the area. Compared to the nearest alternative hotels this hotel is 25th of 50 (11th of 20 three star hotels.) for base rates. Balancing the hotels rates and user rating we rank the hotel 36th of 42 when judging the balance of price point to user rating (Generator Hotel was top).